Mike! So what happened here? I spent a few days in Portland, Ore., a few weeks back for a conference. It was my first time there, and I think like a lot of people who’ve never been to Portland, my ideas of what the city is like have been colored by the sketch comedy series Portlandia — this kind of DIY-hipster enclave full of liberal, zany characters. But I spent my first few days in Portland at my hotel, where the conference was being held, and it didn’t really feel as if I was actually in Portland since conferences at hotels tend to feel the same no matter what city you’re in. I knew this in advance, so I planned to stay an extra day with my friends Meaghan and Dustin and their baby, and they were going to show me around so I could get the full Portland experience. After I checked out of my hotel, Meaghan suggested that I walk to a small coffee shop located near Powell’s Books. I ordered a cappuccino from one of the two baristas staffing the coffee bar and sat at a table while waiting for Meaghan to pick me up. Then, a young woman walked in and asked if there was a bathroom. “Can I take a shower in your bathroom?” she asked. Even that part alone seems quite Portland-y, but where does the Herbal Essences thing come in? Well, the barista, who was formerly totally cool about this, became irate. Now that’s the stuff, I thought. I’m in Portland! In retrospect, I don’t think he actually meant to direct his ire at the brand, Herbal Essences — I think it was more about shampoos with strong scents. Or maybe he did mean Herbal Essences! This was the first time I witnessed a public confrontation about shampoo use, and of course it took place in Portland. The other barista was laughing during all of this, so I think everyone understood how absurd this situation was. I mean, the smell of shampoo after showering plus coffee just reminds me of mornings at home. The coffee shop aroma returned to its natural state pretty quickly. I mean, the only thing I learned was that Portlandia is satirizing this kind of wacky culture in Portland, but just barely, maybe? This experience really could have been straight out of the show. 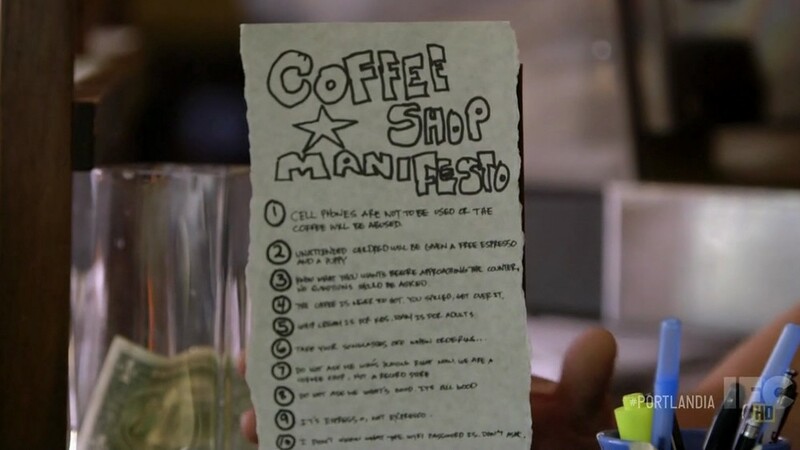 Take this sketch, for example, where a bunch of baristas get together to create a manifesto on how customers are allowed to behave in coffee shops. I can certainly see “No Herbal Essences” on the list. Hot tip: There were people waiting in this massive line to get donuts at this place called Voodoo Donuts near my hotel. I woke up early one morning and walked over there at 7 a.m. and the place was empty. Also, the olive oil ice cream at Salt and Straw was amazing! Join the Tell Us More Street Team today! Have you spotted a tweet or some other web thing that you think would make for a perfect Tell Us More column? Get in touch through the Tell Us More tip line.